Ninja tipped in a possible meetup taking place, it’s an event for Nokia and Microsoft apparently, happening on October 27th. There’s be WP7, Qt and S40 devs there as well as leadership teams from Nokia and Microsoft. We have a special Minibar coming on October 27 to celebrate Nokia World and showcase the apps from the event’s hackathon! Nokia World is the annual Nokia worldwide conference, which is taking place this year at the Excel Centre on October 26 and 27. 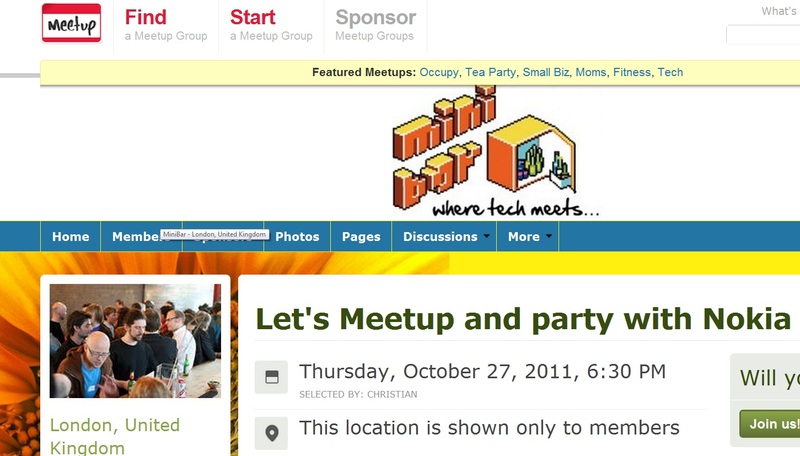 At the event, nearly 40 developers from around the world will be creating new apps for Windows Phone 7, Qt and S40 devices, and you’ll have the first chance to see them in public at Minibar. This special event will take place on a Thursday, rather than the usual Friday, and will be held at Corbet Place in the Truman Brewery, so join us for a drink and some snacks, see these apps’ public debut, and meet leadership teams from Nokia and Microsoft as well. I’m not sure what the itinerary is for Nokia World attendants. The last night is often a meal with bloggers and WOM peeps. If nothing is set, it would be great to tag along to this Nok/MS meet up. Cheers Ninja for the tip. « Looking for a new host for MyNokiaBlog.com – any suggestions?